What's Happening with Troop 5? 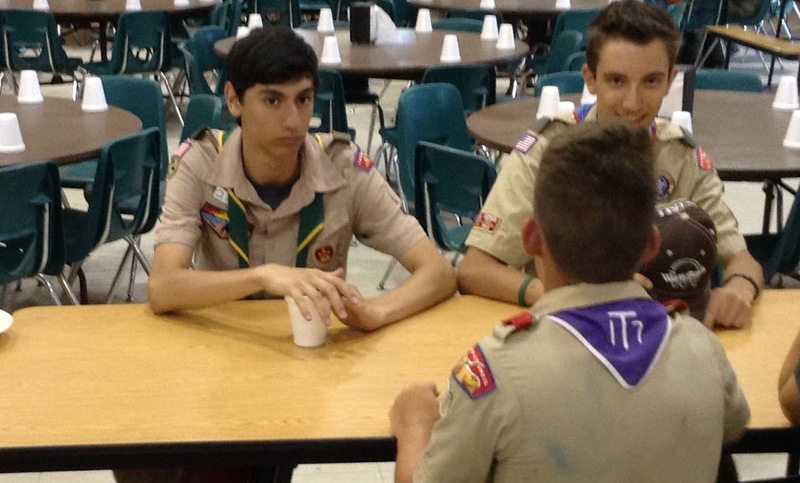 At Troop 5, we have a weekly meeting every Monday. We discuss everything from merit badges to the next week’s campouts specifications. Once a month, we have an important meeting at Cici’s Pizza where the scouts and the Troop Committee separately plan for future meetings, summer camps, etc. Also, the scouts and scoutmasters attend a once a month campout at various places within a few hours drive from Arlington, Texas. At the meetings the week before our campout, the scouts plan the meals they will prepare on the campout when they leave on a Friday night and get back home on the following Sunday. 2-23-19: Kiwanis Pancake Breakfast, First UMC Arlington, 7:30 to 12:00 a.m.
March 8-10, First Weekend of Spring Break, Base camping and Backpacking at Shady Lake (Eagle Rock Loop) in Arkansas. April 13-14, Arlington Sportsman’s Club and Wisch World. Summer Camp, Camp Lewellen, Southeast Missouri, June 15-22, 2019. Info and sign up coming soon! July 20-28, 2019: Rocky Mountain High Adventure Base, Orange Hats. July 26-August 3, Florida Sea Base High Adventure www.bsaseabase.org/: Recently our troop went on it’s annual High Adventure. We attended a week-long sailing trip to the Florida Keys, where we were on a large sail boat for five days. We got to Florida Sea Base by means of a plane flight and a rental car. Once there, we got a few extra items before leaving on the boat. On our first evening, we motored to anchor and watched a beautiful lightning storm during dinner. During the trip, we went to countless coral reefs and saw a hefty amount of sea life. We also had an adept scout fisherman who caught many fish. Sadly though, there was only one of the fish we were allowed to eat. On the forth day, we spent the night in a marina. Leaving Sea Base, we drove and flew almost the same way we came. We had a connecting flight that was delayed many hours due to a storm; a small setback in getting home. During the following week’s meeting our troop shot off rockets in a park. Although we couldn’t successfully launch them for a while, we finally got it down and had an enjoyable time. July 4th, Independence Day Parade: The new troop 5 bus was showcased in the 2018 Arlington Independence Day Parade. We joined our charter origanization, the Kiwanis Club, in this grand event. Over the past few months, Troop 5 has had some amazing adventures. Recently our troop has gone to summer camp at Worth Ranch, which is what we call our home camp. We go to Worth for summer camp every other year. Our most recent campout was at the Arlington Sportsman's Club gun range for youth day, where scouts get to shoot shotguns, .22 rifles, air rifles, and bow and arrows.. All scouts and youth came out to learn about gun safety and shoot a variety of guns. In February, we were again in Austin TX for the UT Merit Badge College. Many scouts had the opportunity to earn and work on multiple merit badges. June 17-23, 5 scouts and 3 scouters of Troop 5 enjoyed the Big Adventure for Summer Camp at Worth Ranch. May 28, Memorial Day Service Event at Moore Memorial Gardens, morning time to be determined. At the troop meetings in May, Genealogy Merit Badge was taught by Gene Thomas. In 2017, we went on a 50-mile Brazos River canoe trip and went out of state to San Isabel, Colorado. As the calendar turns from July to August, it's time to start thinking about (gulp!) back-to-school! This is especially true for those Scouts who are involved in activities like football, band, etc. But August also brings one of the most anticipated campouts of the year: Mr. F's Nearly World Famous Canoe Trip to Broken Bow, OK. Watch for details! Coming Home: The Scouts and Scouters of Troop 5 had a great week in the (cool) mountains of New Mexico. Lots of hard work on merit badges and tons of fun with other Scouts! Be sure to check out all the pictures and stuff on Mr. Shugart's blog, the Bentfinger Chronicles! The troop will be arriving at Key around 2:00 pm on Sunday! Summer Camp 2015! Little Troop 5 left for New Mexico early Saturday, 07/11. They stopped by Carlsbad Caverns and went "batty", then spent the night at Lake Brantlley SP. They will arrive at Camp Wehinahpay around noonish and get checked in. Be sure to follow the Scoutmaster's blog at http://bentfingerchronicles.blogspot.com/ or view the latest entries in the column to the right on the home page! Aquatic School 2015: Troop 5 will have a representative at A-School again this year as Drew M. is attending for a second time. He left for Worth Ranch (where he staffed during the month of June) on Sunday, 07/12 for a week of leadership training, fun, and challenges all built around an aquatics theme. Soon they will begin posting pictures on the A-School Facebook page. A link is forthcoming! Happy Independence Day! Hope all of the Troop 5 family had a fun and safe July 4th! 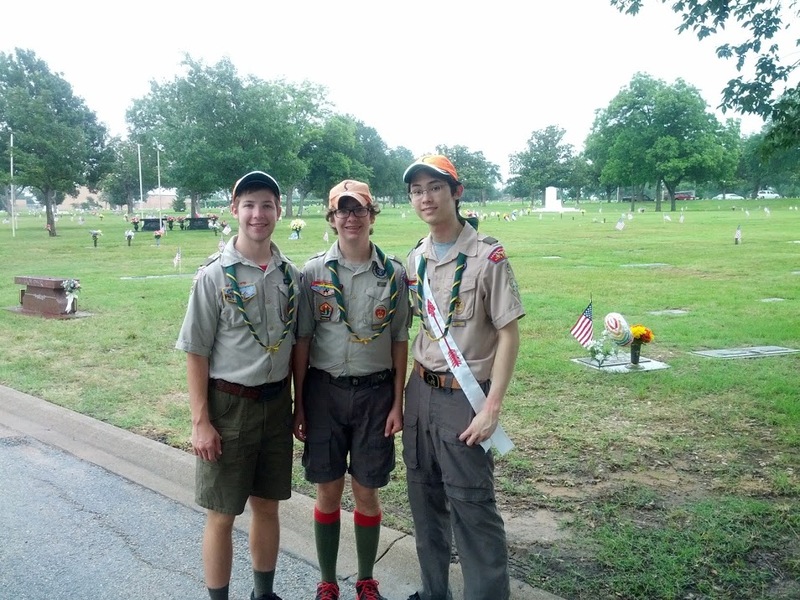 Several Troop 5 folks were in the 50th Annual Arlington parade, which was awesome! There were beautiful fireworks on Friday night at the Leavitt Pavilion, and then Saturday night at the Ballpark after the game. Great weather for swimming, picnics, and enjoying the outdoors with family and friends! Boating on Lake Arlington: Little Troop 5 took advantage of the recent rains (which raised lake levels all over!) to enjoy a day of aquatic adventure. The weather made for a great day of boating! Summer is Almost Here! Schools Out! Yay! And summertime for Scouts means SUMMER CAMP! We are looking forward to taking Little Troop 5 to Camp Wehinahpay in the Sacramento Mountains of New Mexico in July. The Scouts will be working on camp-related items over the next few weeks in preparation. We are excited about cooler mountain temps and working on lots of merit badges! Additionally, four Scouts from Troop 5 will be heading out to Worth Ranch this week to once again serve on staff for the month of June! Placing Flags: On Saturday, May 23, several members of Troop 5 joined with some Arrowmen from the Talahi Chapter, lots of firefighters, and others who put flags on the graves of military veterans at Moore Memorial Gardens. Moore supplies thousands of flags that will fly on the graves through Memorial Day. We had a record number of volunteers helping this year and with the soft ground, this large task was completed in just a little over an hour! Moore then graciously fed us lunch afterwards. Thanks to all who volunteered their time to do what Memorial Day is all about - remembering and honoring. Thanks Cub Scout Pack 52! We enjoyed having the Scouts and leaders from Cub Scout Pack 52 visit with us on Monday, May 4. We hope y'all had a great time and will come camp with us! 2015 Worth Ranch staffers: Even though summer camp seems like a long way off, four Scouts from Troop 5 spent the day Saturday at Longhorn Council headquarters in Hurst preparing themselves for The Big Adventure. They have to do lots of training to be ready to provide leadership for the thousands of Scouts who will attend Worth Ranch summer camp in June! Good luck to Alex, August, Drew, and Max! Garage Sale: And huge thanks to all the Scouts, Scouters, and parents who gave up a Saturday (04/28) to make the annual garage sale another rousing success! 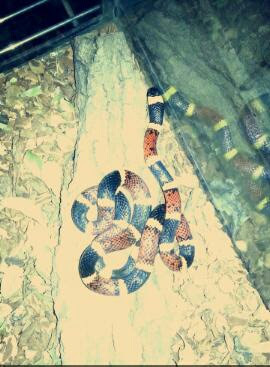 Helps out the troop and probably helps empty our garages and attics! Color Guard: Big thanks to Alex, Andrew, Drew, Max and Nick for doing a color guard presentation at the Arlington 4th of July Committee meeting on Thursday night. It adds a lot to the meeting to have a color guard, especially when the Scouts look sharp and understand how to present the colors. Awesome job! Camporee: Troop 5 had a great weekend of Scout fellowship and fun at the Tejas District's Camporee, April 10-12 at Sid Richardson Scout Ranch (SR2). Even though we're not in Tejas anymore, we enjoyed meeting other Scouts and engaging in friendly troop competitions! And Little Troop 5 earned recognition with a 3rd place overall finish! Great weekend! Arlington Sportsmen's Club Youth Day: Nine Scouts and two leaders attended this annual fun-filled day of shooting! The boys had a great time shooting rifles, shotguns, black powder, and archery and we had some really good marksmen in our group! This was our sixth year in a row to attend and, as usual, Matt Jones and his folks at the Club were awesome! Their facility is simply top notch. (You can check out their website at www.arlingtonsportsman.com.) Thanks to Brian and Mack for providing the leadership for this super opportunity for our Scouts to learn about shooting safely and having fun! Camping in Arkansas: Little Troop 5 spent a very wet spring break in the Ouachita Mountains of Arkansas! Mr. Lehrmann, Mr. Packer, and six of the younger Scouts enjoyed camping in the wooded beauty of the Ouachita National Forest. Mr. Shugart, Mr. Riehle, and four of the senior Scouts backpacked one of the toughest sections of the Eagle Rock Loop. They covered about 18 miles over about two days in the rainy weather. Pancake Breakfast: The annual Kiwanis Club Pancake Breakfast at First Methodist Church was held on March 7. Troop 5 had a great turnout with lots of boys, parents, and leaders helping out. No offense to the Key Club and others, but our Scouts looked sharp in their uniforms and really stood out among the many you th volunteers. It appeared that postponing the event due to weather did not affect the crowd and we hope the Kiwanis made lots of money for their group. They appreciated the help of the Scouts and we got many compliments on our members. Great event and we look forward to next year! UT Merit Badge University: The February campout was the annual "College Road Trip" to the Merit Badge University at UT-Austin on 02/20-22. Thanks again to Mr. Shugart's friend who provided us with a nice place to throw down our sleeping bags so that the fickle February weather in Texas was not an issue! The Scouts had a great time and put in a days work on tons of merit badges! Trailer Clean-up: Thanks to the Scouts and Scouters who took time out of their Saturday to help cleanup, straighten, and organize the trailer. Always good to start a new year with a trailer that is in great shape! January Campout at Worth: The decision to postpone the campout until January 16-18 was a brilliant one. While it was still nippy at night, the afternoon temps were awesome! Great turnout for the first campout of the new year! It's always good to get back to Worth! Happy New Year 2015! Troop 5 is embarking on another great year of Scouting! From Worth Ranch to NASA to New Mexico, it is going to be an exciting year! You won't want to miss a thing! Troop Senate: The troop met on Saturday, 12/13 to plan our camping and other big events for 2015. The Scouts have put together another ambitious year of camping all over the place, including trips to Austin for the UT Merit Badge College, to A&M for the Vet Medicine merit badge, to NASA, plus our "annual" events like Shooting Sport in April and a canoe trip in August. Additionally, there will be two High Adventure trips for the older Scouts plus summer camp in New Mexico! Whew! Get on board now, because it's going to be a great ride in '15! Mission Arlington: Awesome turnout of Scouts and Scouters to help out at the Mission Arlington Christmas Store on Saturday, 12/13! It is great to see Scouts giving back to their community, especially during this time of the year when we realize how blessed we are. Webelos Crossover: A huge Troop 5 welcome to our newest Scout, Dominique from Pack 52! And a big thanks to the guys from Troop 5 who turned out on Thursday night, 12/11 to welcome him! Great work guys! Shout Out: Thanks to the Webelos Scouts who visited with us on Monday, Dec 1! It was great to have you guys and we hope you'll come camp with us soon! And a big thanks to Asst SM (and Troop 5 Eagle Scout) Hayden for leading a great presentation about backpacking gear! Great meeting guys! Galveston State Park: On the weekend of November 14-16, Troop 5 headed south to the beach! 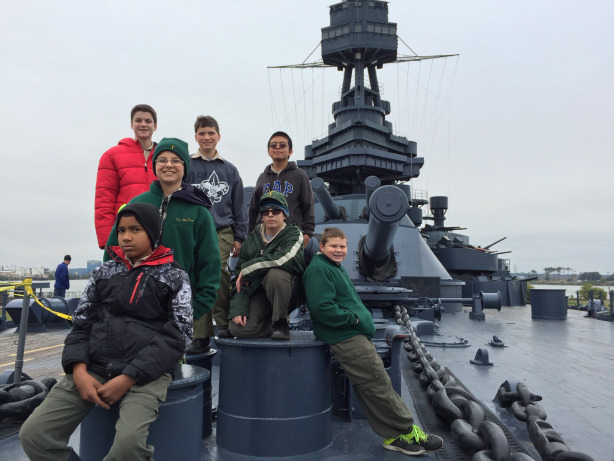 Scouts from Troop 5 got to tour the San Jacinto Monument, the Battleship Texas, and camping at Galveston State Park. The weather was bit chilly and slightly damp at times, but they got to see lots of amazing, historic sites! Whether it was being on the grounds where Texas won it's independence, on a huge ship that protected America, or seeing spacecraft that carried men to the moon, this was an eventful campout!!! Law & Crime Prevention Merit Badges: On Monday, 10/13 (Columbus Day), several members of Little Troop 5 traveled to Fort Worth to work on the Law and Crime Prevention merit badges. Thanks to Mr. Shugart and all the good folks at the Tarrant County Courts for making this possible! Hiking and Fishing at Tahuaya: On 10/10, Troop 5 headed south to Camp Tahuaya, the southernmost of the Longhorn Council camps. We enjoyed the cool weather that (finally) rolled in, but it did bring some storms that damped the campsite but not our spirits! After it cleared off, we worked on the Geocaching merit badge, got in a five mile hike, and then a little fishing. Fish weren't biting much but there was some great rock skipping (Coincidence? Who knows?). Saturday evening was the Great Cookoff Challenge between two patrols. Great job everyone! Open House Success: Thanks to all the Scouts, Scouters, and parents who made the open house a success. The numbers weren't huge, but apparently we signed up 100% of the Webelos who attended! Welcome new Scouts to the Little Troop 5 family! More Popcorn Sales! Little Troop 5 had another great popcorn sale this weekend. Rumor has it that we sold about $2400 worth of popcorn! Man, that is a lot of kernals! Awesome effort! Thanks to all the Scouts and Scouters who endured the September heat! (What to the "unseasonably cool" weather? 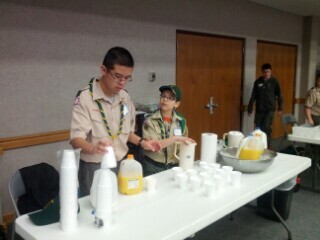 Oh yeah, this is Texas...) Reminder that Scouts should also be taking orders for popcorn too! Wisch Ranch Campout: For the September campout, Little Troop 5 headed out to Palo Pinto county to WR. Not Worth Ranch, but "Wisch Ranch". It was a bit soggy and the temperature was unseasonably cool for Texas, but the Scouts had a great time working on the new youth leadership program called ILST - Introduction to Leadership Skills for Troops. Popcorn Sales! Thanks to all the Scouts and Scouters who helped to sell popcorn the past couple of Saturdays. This is the most significant fundraiser for Longhorn Council each year and some of the money stays in the troop to help defer costs for us. Great job, guys! Labor Day Picnic: On Monday, Sept 1, the troop had a picnic at the Montessori School rather than a traditional meeting. We grilled hot dogs and hamburgers and the Scouts had fun throwing around footballs, Frisbees, and probably some stuff they shouldn't have been throwing! Great family time together as the school year gets rolling! Back-to-School! Have a great first day of school and come to the troop meeting at 7:30! Stay tuned for details about the September campout and other fun events! Congratulations new Arrowmen! Congrats to Logan, Quincy, and Mr. Riehle who completed their Ordeal to become the newest members of the Order of the Arrow from Troop 5. Welcome to the Brotherhood of Cheerful Service! Mr. F's Nearly World Famous Canoe Trip: On 08/08, Troop 5 once again headed north to Broken Bow, OK for it's annual canoe trip! Ten Scouts from Troop 5 were joined by several alumni of the troop plus some members of Everman's Troop 120 for a weekend of camping and aquatics! The cool water felt great, although it was slightly cooler in OK than in TX! Thanks to the "supermoon" no headlamps were needed! Also on Saturday night, the troop celebrated our latest Eagle Scout, Austin, with a special Court of Honor. See our pictures here. Clean-up at McGaw's: On Saturday 07/25, Troop 5 spent an afternoon cleaning up at the McGaw's parking lot. The McGaw's are really generous to allow us to park our trailers on their property - behind a locked fence - for free! In return, we help them out by clearing trash, brush, debris, etc. from the lot. Thanks to Alex, Andrew, August, Drew, Garrett, James, Logan, Luke, and Nick plus a number of adult leaders for spending their weekend in service! 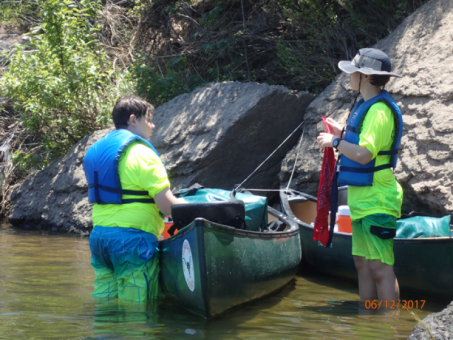 · Longhorn Council Aquatic School - Leadership and Merit Badges for those who love the water!